The majestic Place de la Concorde is another impressive site and is renowned for its important part in French history. On many occasions, the square has been the place chosen for happy or sad national gatherings. The Place de la Concorde plays a great symbolic part along the Historical Axis. This magnificent vista runs through some of Paris’ most celebrated monuments and squares: from the Louvre and the gardens of the Tuileries to La Défense, passing through the Champs-Elysées, which are dominated by the famous Arc de Triomphe. The square takes the form of an octagon measuring 359 by 212 metres, bordered by the River Seine to the South and classical-style buildings to the North. The Egyptian obelisk stands at the centre of the square, flanked by two massive fountains. In 1753 it was decided that the site should be designed as a square. This decision was taken during the reign of King Louis XV, when many French cities had started or completed prestigious squares, commonly called “Place Royale” to the glory of the King: Montpellier, Nantes, Metz, Dijon or Bordeaux. In the independent Duchy of Lorraine, the King’s father-in-law, Stanislas Leszczyński, commissioned the beautiful Place Stanislas in Nancy, which was well underway by 1753. Gabriel, the King’s architect, was given the task of creating a magnificent square along the Historical Axis which would stage an equestrian statue of Louis XV in the centre. The two monumental pavilions bordering the northern side on the square and divided by the Rue Royale were built in the Louis XV style: the Hôtel Crillon and the Hôtel de la Marine. Misfortune struck the square on the occasion of the marriage of the Dauphin Louis and Austrian archduchess Marie-Antoinette on the 30th May 1770, when a celebration, with much pomp and ceremony, was organised there with a firework display. Following the accidental fall of a rocket, the crowd was panic-stricken and 133 people were killed trampled and choked. But the worst was yet to come 20 years later with the uprising of the Revolution. Originally called ‘Place Louis XV’, the square was renamed in 1792 as ‘Place de la Révolution’ when it became the stage for the horrendous public executions by the guillotine. During the Reign of Terror, the King, the Queen Marie-Antoinette, and more than 1,100 victims were beheaded in less than two and a half years. On 21st January 1793, Louis XVI was guillotined at the very position of the statue of Brest, at the North-West angle. From the 13th May 1793, the “National Razor” was moved across the square near the railings of the Tuileries Gardens and beheaded many more victims: Marie-Antoinette (16th October), Madame du Barry, Danton, Madame Roland and Robespierre. Following those dreadful events of the Reign of Terror, the Directorate changed the name of the square to one of reconciliation and hope: Place de la Concorde. In the 1830s, architect Jacques Ignace Hittorff transformed the square by adding statues and fountains that can be seen today. Lille, Strasbourg, Lyon, Marseille, Bordeaux, Nantes, Brest and Rouen. 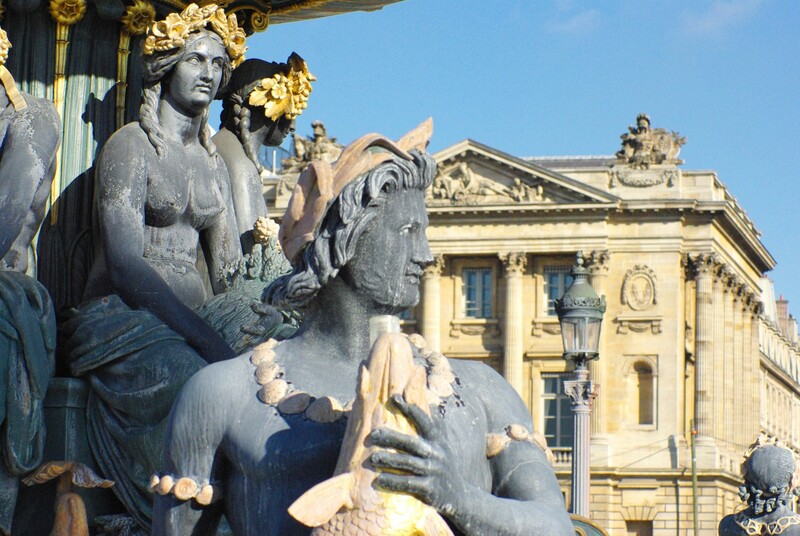 Hittorff also added two monumental fountains inspired by those in Piazza Navona in Rome: the Maritime Fountain (to the South, portraying the maritime spirit of France) and the Fountain of the Rivers (to the North, representing the Rhône River and the Rhine River). The Obelisk, ideally placed in the middle of the Place de la Concorde, is part of the strange geometrical layouts and alignments along the Historical Axis, evoking the symbols of Ancient Egypt. To understand the reasoning that led the French to develop such admiration for Egyptology, one needs to go back to Napoleon Bonaparte’s campaign to Egypt in 1798. For it was the French Emperor-to-be who attempted to conquer Egypt in order to counteract the English influence in the Middle-East and India. The General was not only coming to Egypt with soldiers: as a newly elected member of the French Academy of Sciences, he took with him 167 savants to Egypt in 1798, and founded the first modern scientific institute in Egypt: the Institut d’Egypte in Cairo. King Charles X (1757-1836) showed an interest in Ancient Egypt and commissioned Jean-François Champollion (who deciphered the ancient hieroglyphs) to arrange for an obelisk to be brought back to Paris. In 1831, Mohammed-Ali, Viceroy of Egypt offered France one of the two obelisks which guarded the entrance of the temple of Luxor in Upper Egypt. Both dated back to the time of Pharaoh Ramses II, arguably the most powerful king of Ancient Egypt. A special ship, the Luxor, was designed to carry the obelisk to France down the Nile and across the Mediterranean Sea to the port city of Toulon, and then by river to Paris. In Charles X’s plans, the obelisk was to be positioned in the Place de la Concorde, the same square which was built for his grand-father and where his brother and sister-in-law were beheaded. On the 25th October 1836, 200,000 people gathered at the square to witness the lifting operation to raise the obelisk onto its pedestal. To the relief of supervisor Lebas and the assembled crowd, the whole event was a success and from this day, the “Obélisque de Louxor” sits enthroned in the centre of the square. 3,500 years old, the obelisk is the oldest monument standing in Paris. It is 23 metres tall and weighs 220 tons. The French capital, however, was not the first European city to display an obelisk. The one standing in Saint Peter’s Square in Rome was transferred by the Romans to decorate the circus. Other specimens erected after Paris can be found in London (the obelisk of Tuthmoses III on the Victoria Embankment, better known as ‘Cleopatra’s Needle’) and in New York (a twin obelisk to the one in London, erected in Central Park). When the obelisk was carried to France in the 19th Century, its original cap had long disappeared (it was believed to have been stolen in the 6th century BC). In May 1998, the French authorities decided to refurbish the obelisk by putting a copy of the missing gold-leafed pyramid cap on top, thanks to the initiative of Egyptologist Christiane Desroches Noblecourt. This pyramid cap is called a pyramidion and is supposed to reflect the rays of the sun. In 1988, this great Egyptian landmark was joined by another pharaoh-related structure along the Historical Axis: the modern Glass Pyramid in the Louvre, evoking the Great Pyramid of Giza. The Place de la Concorde set the stage for another North-South perspective, much shorter, perpendicular to the Historical Axis. It features, on the South side, beyond the bridge “Pont de la Concorde” across the Seine, the Palais Bourbon building and on the North side, at the end of Rue Royale, the Madeleine Church. Both monuments match each other across the Place de la Concorde with their grand Classical-style porticos, evoking the design of Roman temples. The 19th century Madeleine Church strangely resembles a Roman temple and shares some similarities with the ancient ‘Maison Carrée’ in Nîmes. The Palais Bourbon housed the National Assembly and its pedimented, colonnaded front was inspired by that of the Madeleine Church at the far end of the short perspective crossing the Place de la Concorde. The Pont de la Concorde, crossing the Seine and linking the Place de la Concorde to the Palais Bourbon was completed in 1791 with many of its stones taken from the dismantled Bastille fortress. When complete, it was said that the people of Paris could from then on ride roughshod over the ancient fortress. The view from the bridge stretches to the Eiffel Tower, the Alexandre III Bridge on one side, and on the other to the Tuileries Garden and the Louvre.